Full disclosure: I don't drink alcohol. I had 1 glass of champagne at my wedding, and another glass after graduating college, but other than that and a slug of Nyquil once or twice when I've had a bad cold, nada. Mind you, I've got absolutely nothing whatsoever against those who do imbibe. I've worked at renaissance faires for years, and done a tour of duty in the Marines, so I'm no stranger nor prude when it comes to consumption of adult beverages. It's simply a habit I've never acquired. But people who drink and subsequently operate motor vehicles, IMHO, ought to be summarily executed on the spot when apprehended. Some countries do virtually this, and their drunk driving rate approaches zero, with a recidivism rate of exactly zero. I can remember one time when I was being followed by some jerkweed at night, regardless of whether I sped up or slowed down, and it took a 2 million candlepower floodlight pointed back over my shoulder to get him to back off my bumper. About 3 blocks later, he ran past me as I turned off, then he went through a red light, into another car, and slamming into someone's bedroom wall, after (I later learned) having sideswiped 3 other cars - all while intoxicated. This was immediately after my floodlight trick enabled me to put some distance between us. Had I been one of the other victims, instead of a mere near miss, I think I'd have beaten the guy to death long before the PD ever arrived on scene. I take attempted murder via automobile seriously. But you shouldn't think I have no sense of humor. One Sunday afternoon, after the then-wife-unit and I were doing laundry and visiting my mom at home, we were headed back to our little apartment in separate cars. As a light we were waiting for turned green, we were both - in adjoining lanes - nearly rammed by some doofus who turned left as soon as the light turned in our favor right across the path of both our cars. Best of all, he was looking the other way when he passed, not even noticing the oncoming traffic - in this case, the two of us. He could have killed either of us. Pulling over, I yelled to the wife-unit in her car to return home, and I'd follow Mr. Idiot and straighten him out. I should point out that this was a decade or more back in the pre-cell phone era. Well, Mr. Idiot drove around, going far too fast, then far below the speed limit, and back again, weaving in and out of lanes and around other cars. Fortunately, it was mostly in residential areas, and traffic was rather light. He was apparently drunk, but it was only when I noticed he was rubber-necking at every corner that the Whole Truth dawned upon me: this jackhole is looking for an open liquor store! Now I was really starting to boil, as he careened from one near disaster to another, and as usual, there was no cop around to flag down anywhere. Well, after 20 minutes or so of following Mr. Idiot, he finally found a local bottle-seller to slake his thirst and continue his buzz. By this point, I was ready to rip his head off and crap down his lungs, and I parked across the street from his parked vehicle, and headed over to "educate" him. He was by this point standing in line with another pair of a six-packs of beer in hand, and visible through the glass storefront as I approached him, with a view to activating his dental plan. As I passed his car, I noticed the driver's window was open. And the engine was running. Which meant that the keys were still in the ignition. O, happy day! I said to myself, "Self, we don't NEED to have this "conversation," do we?" And leaned into his car, reached over the steering column, and turned off his car, pulling the keys out of the ignition. I turned, pocketed them, and headed back to my car. On my way home, I threw his car keys out the window and into one of the local flood control channels for the L.A. River. My only regret was not being able to see the look on his face as he searched his pockets, the car, the store, the parking lot, and God knows what else looking for the keys he no longer had. And I still kind of wish I'd beaten him to a bloody pulp anyway, or seen him taken away in handcuffs, but with the cavalier way the courts treated drunk driving back then, I suppose it's better the way it turned out. I was defintiely smiling when I got back home to help put away the laundry. I mentioned some posts back that Arnold Schwarzenegger was one of two actors I'd ever met in Hollywood who had "It". The other one was Anthony Quinn. Antonio Rodolfo Quinn was born in 1915, and died in 2001, aged 86 years. When I met him, he was 80 or so. After a long and glorious career in big-screen Hollywood, Mr. Quinn had finally consented to do a TV commercial. For Pizza Hut, no less. I was there to tend to him, if need be, because he'd previously suffered multiple heart attacks and coronary bypass surgery. And he was 80. We were shooting on a hot afternoon in California, on the Ahmanson Ranch property just west of the San Fernando Valley. It was your basic commercial set, low-budget for crew, no expense spared for the product. As it should be, I suppose. We spent our morning doing the usual setting up and prepping for the shot. Just another day. He was pale as a ghost. I was really afraid I'd end up working on him medically, given that it was in the 80s to 90s. I had no idea when I first saw him that he was a force of nature. I can't remember the name of the producers, directors, assistants, etc. on hand that day. They were just my bosses. 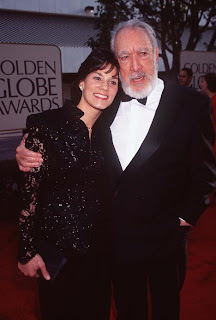 But I remember the reaction to Anthony Quinn. The man had appeared in nearly 100 movies by then. He had not 1, but 2 Academy Awards sitting on a mantle somewhere, both of them older than me and almost the entire balance of the crew. He was larger than life. When he appeared, every eye on the set was on him. I mean every one. Setting up was ignored, directors were ignored, producers were ignored, and Pizza Hut was a distant memory. I looked around, and saw that everyone, from one side of the set to another, was watching his every move. This was a legend, and no one was going to miss a single tick of the clock doing mundane tasks. He went to wardrobe and makeup, which allowed a brief respite for the crew to finish preparing everything for his return among us. He was sutiably restored to our attentions dressed like a return role in Viva Zapata II! The son of a man who rode with Pancho Villa before moving to Los Angeles and becoming an assistant cameraman, the only Mexican-American to win an Oscar, and then win another one, was returned to us dressed as a campesino with bandoleers, looking like he'd just stepped off the set of The Magnificent Seven. Some twit at Pizza Hut's ad agency probably thought this was great fun rather than a hokey slap in the face. Fortunately for them, Mr. Quinn had a good sense of humor, and little in life left to prove, so he was a great good sport. And could he laugh! With, once again, every eye on set focused on him like a laser beam, he came out, sat where he was directed, and got to work. There was no tension per se, but doubtless the other unknown actors and and background around him had to be a little self-conscious. Until in between takes, Quinn started telling a joke or two, and laughing at other remarks. The King was happy, so everyone else was too. What could be more natural? How could you top this? We found out at lunch. Along with Mr. Quinn were his former secretary, current companion, and yet-in-the-future third wife, 20-something year old Kathy Benvin. Who was gorgeous, which spoke well for an 80 year old actor's appeal. But this was just the warm-up. She also had in tow Mr. Quinn's then latest progeny, 2 year old Antonia. Now we were all witness to magic. Because to see an 80-year-old man playing peek-a-boo and hide-and-seek with his 2-year-old little girl was to witness the most remarkable transformation. Quinn was no longer 80. He was more like 20 again. Just another father playing, laughing, cuddling, chasing, picking up and playing with his newest child. Gone were the years between, gone was his physical age, leaving only behind the pure, unadulterated delight a father takes in his daughter's smile and laughter. After lunch, Mr. Quinn went back to work. Commercials are usually rather grueling work, and despite his age, the affair lasted the balance of the day, in the heat. I forgot about the ghastly palor on his face as I stayed near the on-camera activities, and watched Anthony Quinn work at 80 like the true professional he'd been since his 20s, in take after take, as we mere mortals all sweated and swilled down buckets of cold bottled water. And at the end of the day, he still had a smile, a pleasant temper, and every bit of energy on camera he'd had at the beginning of the morning. And after he finished, he still had even more energy to devote to his little girl's attentions, giving her far better than he even gave to the camera. And the entire crew, top to bottom, was continually mesmerized by every second of a day I'll never forget.